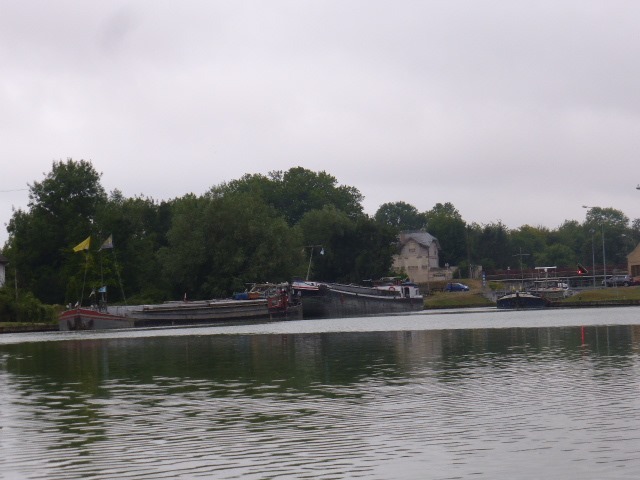 Walking whilst cruising on the St Quentin was impossible as all the locks were enclosed in tall fencing which meant I couldn’t reach the lifting lock operating bars from the towpath and, until you reach Berry au Bac and turn onto the l’Aisne a la Marne there are no towpaths anyway. 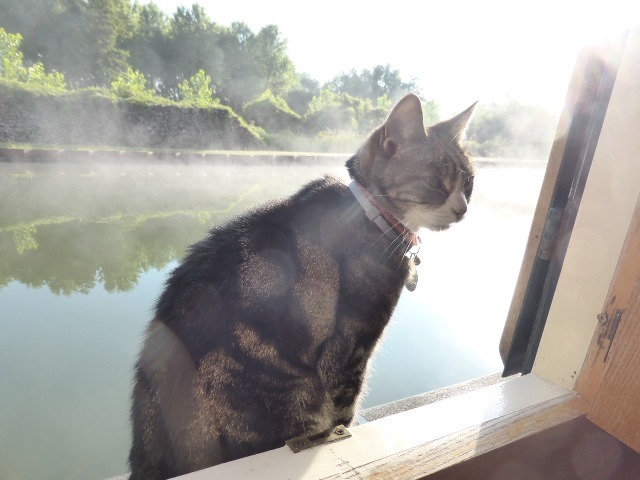 Must admit it’s been way too hot to walk anywhere again really – just a quick 30 minutes first thing in the morning and then 45 mins or so in the evening at dusk. Sadly they couldn’t stop as they were delivering a load of barley (for beer) and they only had time for a quick natter and a beer top up (for personal use) at the adjacent supermarket. We left Pinon on Monday and just didn’t stop! It was so hot we weren’t prepared to lose our cruising breeze – standard technique for surviving the heat was to get under the cold shower fully dressed. 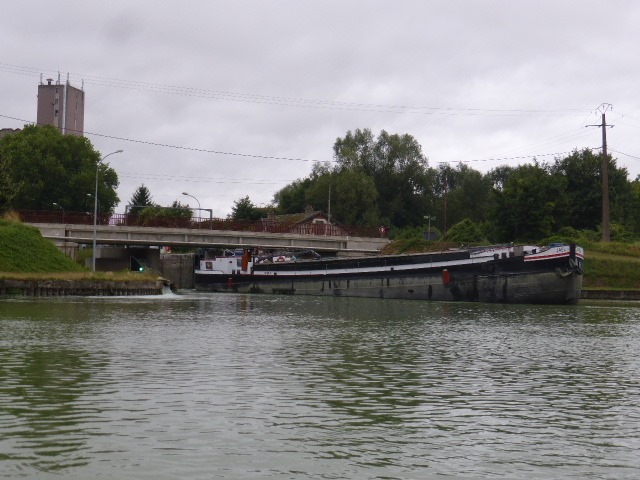 We moored at Berry au Bac in the evening having covered 42.71 kilometres, 9 locks and 1 tunnel!! 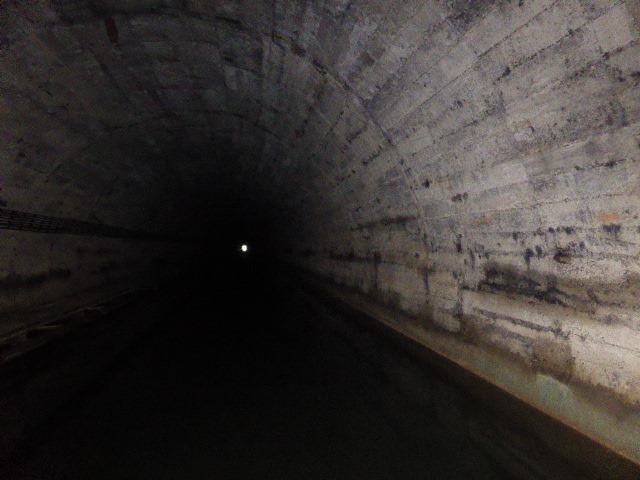 Incidentally the tunnel was the first we’ve been through here where the lights weren’t working – sadly it was also the first time we haven’t checked our tunnel light before entering; that wasn’t working either! The lights you can see are the domestic ones from inside the boat. As always, Berry au Bac was busy with commercials waiting to load and unload at the 2 nearby silos. 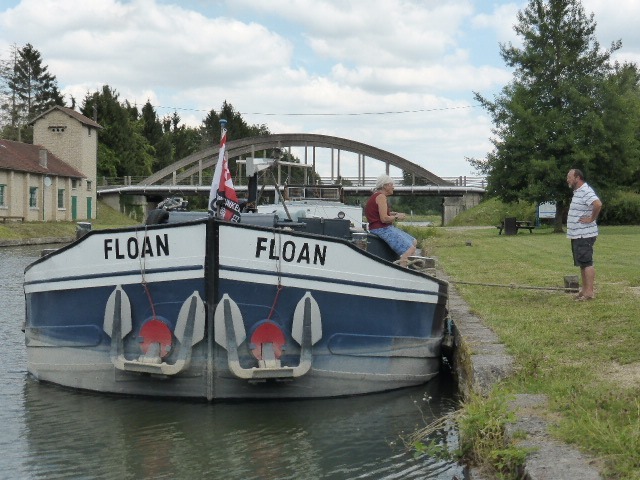 I love watching them reverse through the first lock to be loaded at the silo above – no place for them to wind for miles – they load with water ballast to squeeze under the low bridge immediately in front of the lock. The lady from the peniche opposite climbed down their ladder and into the water 3 times with each of her 3 dogs to cool them off. We’ve been using water sprays and buckets to keep ours cool where they can’t get in. A misty start heralded another beautiful day as we headed towards Reims intending to moor just before the city. 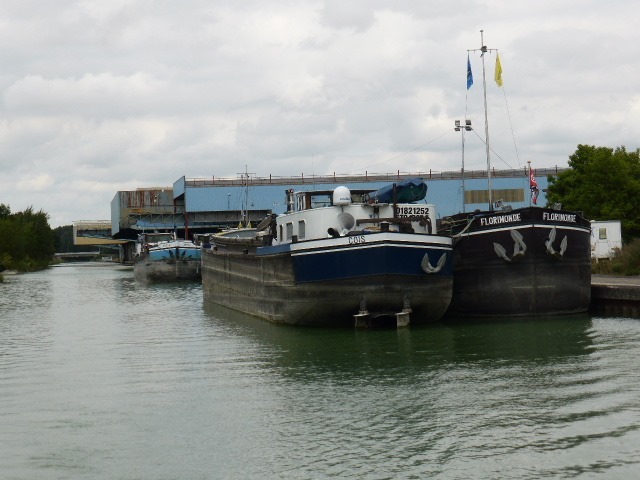 Again, no pleasure craft around just the odd commercial (only small ones though on the l’Aisne a la Marne). 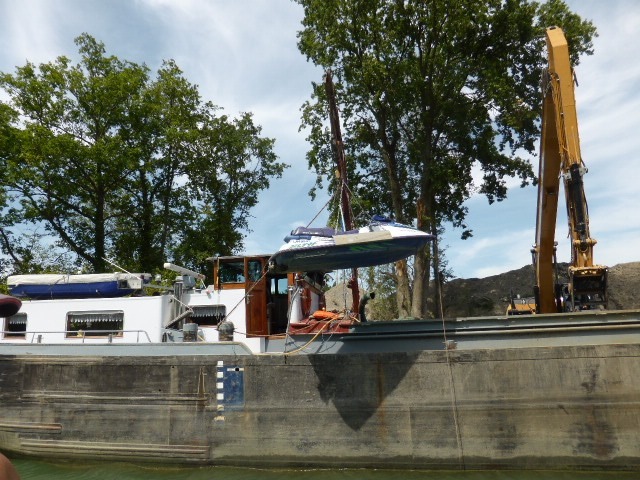 I had to smile watching this guy hoisting his jet ski out of harms way whilst his boat was being unloaded of dredging waste. I was able to walk Muttley for a brisk 4 k in 45 minutes and we alternated the helm and domestics to split the day up. 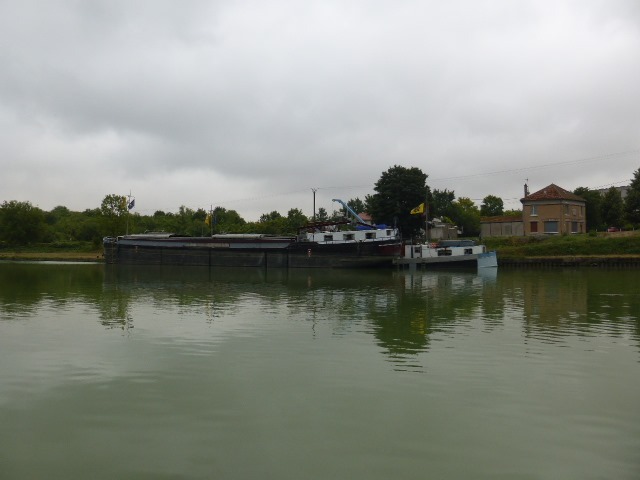 Having reached our intended mooring at 2 pm the madness struck us again and we continued onwards, passing the French holiday resort and staying out of the way whilst the peniche, that was fast catching up with us, winded. It was my watch and I thought he was going to overtake us. 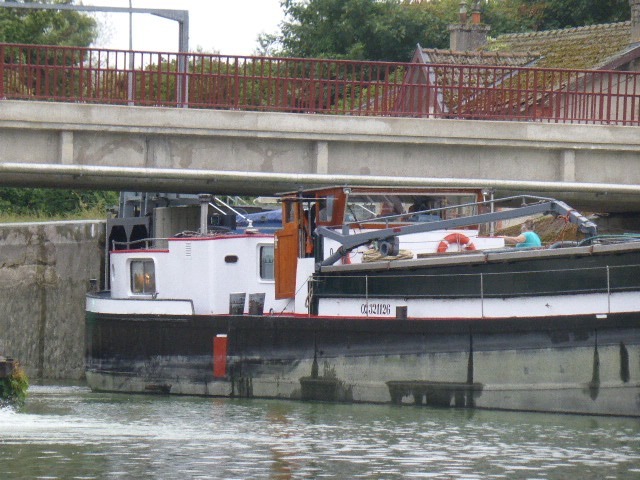 When on narrow waters (by French standards) I have developed a failsafe technique for handling the boat whilst being overtaken by large craft – 2 beeps on the horn and an alternative skipper, with strong arms, miraculously appears; I can’t physically hold the tiller when they overtake in very close proximity, but this one below decided to wind in the wide behind us and as can be seen from his prop wash he was in a hurry to complete the manoeuvre which, with the power and steer ability they have, he completed in nigh on his own length in a single turn. 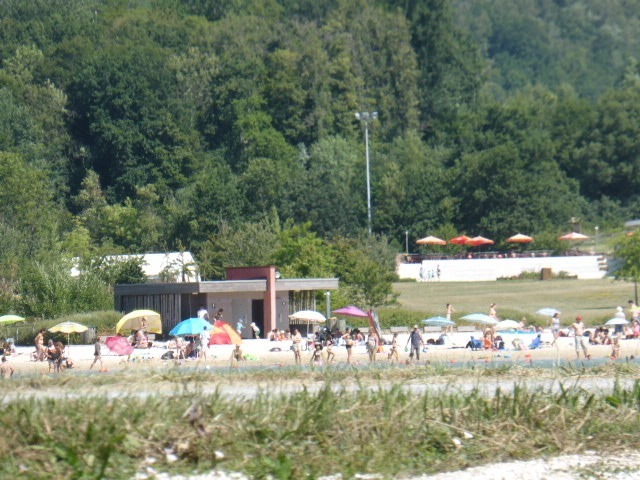 It was a good job that it was a scorcher of a day as there were four young lads, who had been swimming there minutes before, standing on the bank directly behind where his prop wash was landing enjoying the shower. 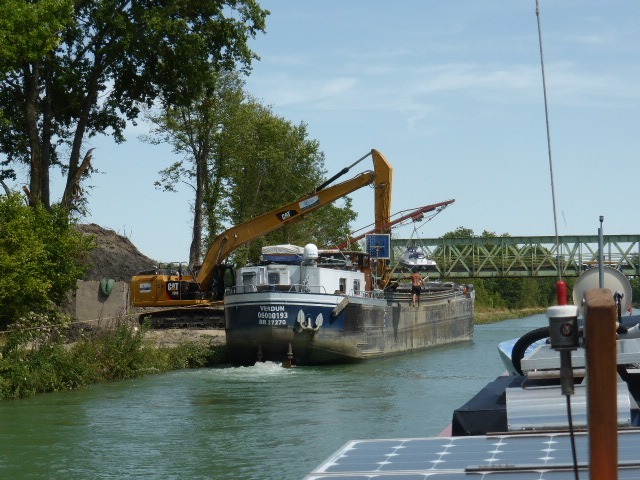 We approached the last lock before Sillery halte fluvial and waited for 5 mins whilst a peniche came down. When he cleared, and we were about to go in, the gates shut and the lights went out. Our 5 minutes wait took us up to 6 pm – closing time apparently! Very early for August. So here we stayed for the night in a lovely spot with a paddling stream for the dogs, shade for us and two delightful donkeys. 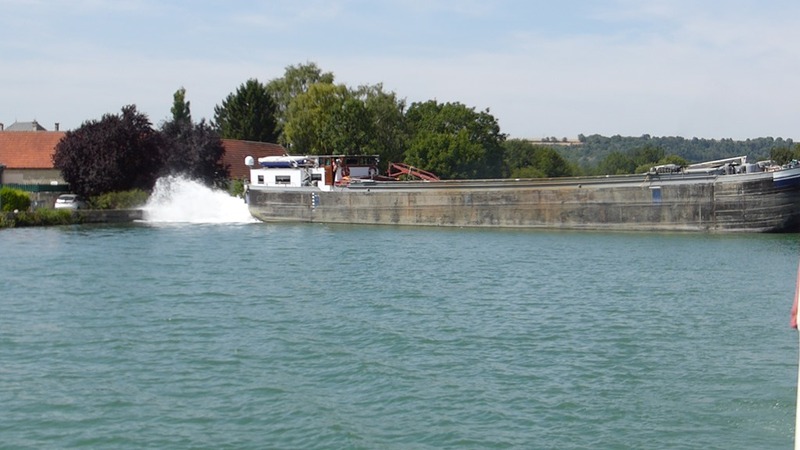 Another crazy 34.3 kilometres and 12 locks; that 77k and 21 locks in 48 hours! I think it’s because we’re travelling on old ground and can’t wait to get onto new territory. 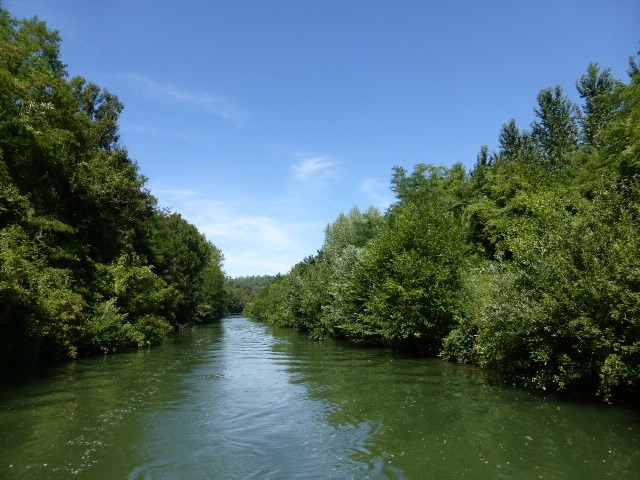 This morning G cycled off to Reims station, leaving at 11.15am, to recover the car from St Quentin – unfortunately the internet didn’t inform him that he would have to change trains and would have a three hour stop over at Laon. I won’t be seeing him again anytime soon then! 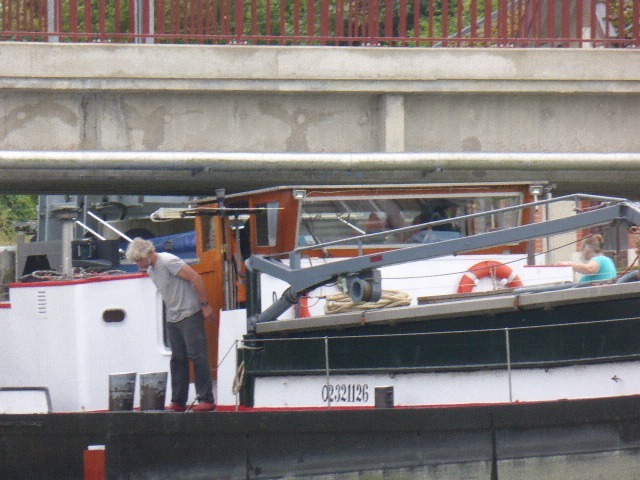 He arrived back at the boat at 7.15pm. This entry was posted on 06/08/2015 at 4:58 pm	and is filed under Uncategorized. You can follow any responses to this entry through the RSS 2.0 feed. You can leave a response, or trackback from your own site. 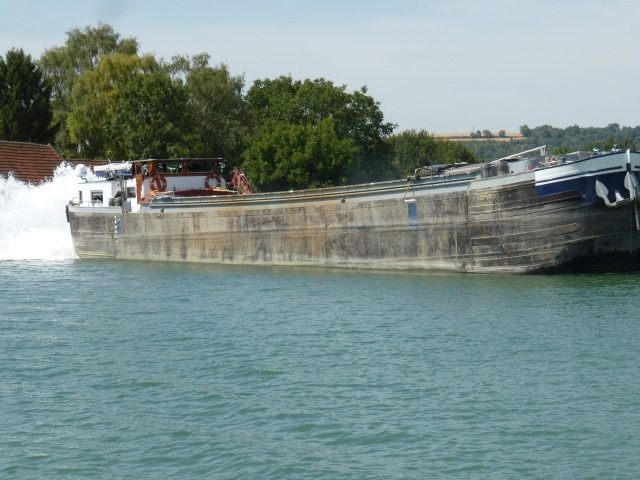 Thanks for the update Jill, wow those Peniche crew really do know the capabilities of their craft don’t they! That one looked a bit close to the bridge for my liking. The Continentals seem to like their inland beaches, not needed here in Cornwall of course! but then nor is the heat you’ve been having, We have been averaging 17 to 22C over the last week or two, unfortunately nearer the 17 in the last few days.